Laboratory analysis of the residue and other archaeological evidence found in the cave indicate, that the beer was made from from seven types of plants including wheat or barley, oat, legumes and bast fibers including flax. “They packed plant-foods, including malted wheat/barley, in fiber-made containers and stored them in boulder mortars. They used bedrock mortars for pounding and cooking plant-foods, including brewing wheat/barley-based beer likely served in ritual feasts 13,000 years ago,” the scientists wrote in the Stanford News. 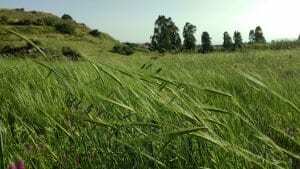 The team postulated that the Natufian brewery used a three-stage process: malt production from the starch of wheat or barley through grain germination, mashing of the malted grain, and finally, fermentation through the aid of wild yeast. Liu hypothesized that the beer production was of a religious nature because its production was found near a graveyard. “Beer making was an integral part of rituals and feasting, a social regulatory mechanism in hierarchical societies,” said Jiajing Wang, a doctoral student at Stanford’s Department of East Asian Languages and Cultures and a co-author of the study. Last year, the researchers brewed their own version in a class at Stanford, based on extensive research on the brewing techniques of early human civilizations. According to the researchers, the beer was entirely unlike what we call beer today. “It’s more like a thin oatmeal,” Wang said. The recent discovery is not the only evidence that beer was present in the region in ancient times. In 2015, archaeologists discovered a 5,000-year-old beer vessel in a dig in downtown Tel Aviv. The recent discovery confirms that the beverage has deep roots in Israel. Nonetheless, brewing of the type initiated by Natufians thousands of years ago became almost non-existent when the Arab Muslim Empire conquered the region in the 7th Century. Yechiel Luterman, a Canadian immigrant to the Golan, wants to change that. Luterman is in the process of opening a distillery in his new home named Edre’i. Though beer is not mentioned in the Bible, barley was the central aspect of the Omer offering brought after Passover and was also one of the seven species that brought a special blessing to the land of Israel. Luterman is beginning to malt barley, just as the Natufians did thousands of years ago. Luterman’s initiative also has practical benefits.